(Fortune) -- Unaudited results are in for the second year of "Buffett's Big Bet" -- Warren Buffett's 2008 wager against Protégé Partners that a low-fee index fund will outperform certain funds of hedge funds -- and the famous investor has gained some ground on his challenger. In the 2009 segment of the 10-year bet, an S&P 500 index fund -- that's Buffett's pick -- outdid the average performance of the five funds of funds that New York-based money management firm Protégé backs, 26.2% to 15.9%. 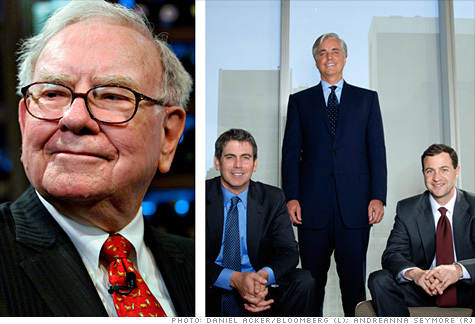 But Buffett's spurt was not enough to undo the lead that Protégé's funds had racked up in the turbulent year of 2008. True, the standings for the two years combined show both contenders having lost money. But Protégé's picks are down 11.8%, less than the S & P's minus 20.2%. Both sides are measured net of all fees, costs, and expenses. By the terms of the bet, Protégé has never publicly disclosed the names of the five funds it picked. One of them is assumed to be the fund of funds that Protégé itself runs. Buffett does know the names of the five funds and has seen their audited results for 2008. He will not see 2009 audited results for the funds until later this year. The two sides, however, agreed last fall that "approximate" results for the previous year would be announced each spring, in time to be discussed by Buffett at the Berkshire Hathaway (BRKA, Fortune 500) annual meeting, which is to take place in Omaha this week, on Saturday, May 1st. The precise index fund "bought" by Buffett is Vanguard's S&P 500 Admiral fund (VFIAX). In a sense, the horses in this race have so far run true to form. In an up period for the market, which 2009 obviously was, the general market often beats hedge funds. But in a bad year, and 2008 certainly fits that description, the short selling that many hedge funds engage in and their freedom to roam beyond stocks allows them to cut their losses and whip the S&P. In 2008, S&P's Admiral shares were down a devastating 37.02%, The Protégé funds managed to fall by "only" 23.9%. The money involved in this bet is $1 million -- sort of. That qualification is necessary because of a present-value factor. Each side originally put up $320,000 as its wager. The total funds of about $640,000 were next used to buy a zero-coupon bond that will have appreciated to a value of $1 million at the end of 2017, when the bet concludes. That prize will then go to the winner's charity. If Protégé wins, it wishes the money to go to Absolute Return for Kids, an international philanthropy based in London. Buffett has designated Girls Inc. to get the money if he wins. The party holding the money -- that zero-coupon bond -- is Long Now Foundation of San Francisco, which oversees a mechanism called Long Bets that will pay off the bet. Both Buffett and Protégé have posted arguments on Long Bets' Website that explain why each thinks its bet will win. --The writer of this article is a friend of Warren Buffett's and the editor of his annual letter to Berkshire Hathaway's shareholders.